You can quickly send a text message from anywhere in Sentle where you see this icon. Clicking on the ‘Send SMS’ button will open a new window into which your message can be written. You can type your message into the window Sentle will let you know how many characters you have used. A single text message has a limit of 160 characters, with any messages sent that use more than this considered a ‘multi part’ message as shown in the details underneath the message itself. Any text messages sent or received will be stored on the Contact’s timeline as shown in the image below. 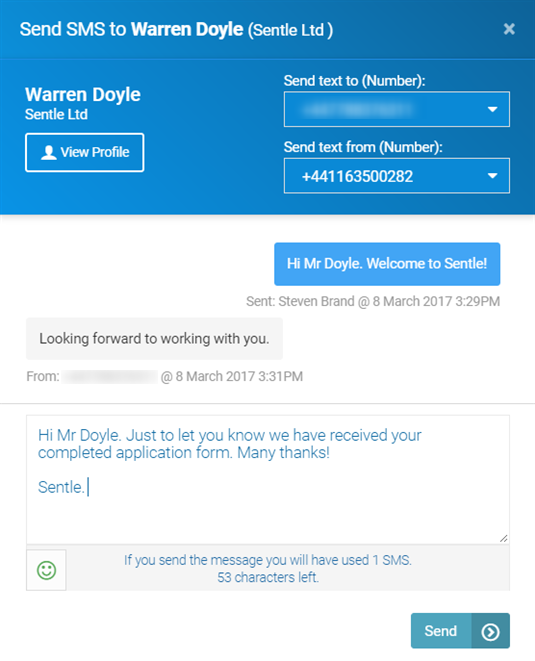 You can reply directly from the timeline to any received message simply by selecting ‘reply’ which will load the message window again into which your message can be added.